Insurance companies have become increasingly reluctant to issue Homeowners Insurance Policies on older homes (usually 30 years old or more). 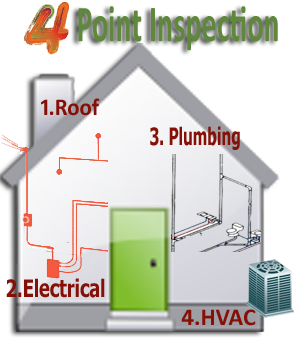 In order to qualify, a 4-Point Home Inspection focusing on four main areas of interest as indicated below must be performed on these homes. The 4-Point inspection tells the insurance company what upgrades have been made to the 4 areas listed above.